Driving to and from Arizona every year can become a bit boring for Canadian snowbirds – but it doesn’t have to be. Turning the journey into an adventure and discovering one or two new places each time you take that long drive is a fun way to break up your travel. We’ve compiled a list (organized by state) of some of the places you might want to stop and explore for a few hours, or even spend a night or two. Of course, depending on your route some of these places may be too far out of your way, but all of them are well worth a visit if you happen to be driving by. Sedona is due north of Phoenix at the top end of Oak Creek Canyon and well worth a detour. Surrounded by red-rock formations, steep walls and forests, Sedona is known for its flourishing arts community, trendy boutiques, spas and galleries. It also features great hiking trails just outside town that are ideal for a picnic stop. If you’ve never seen it, you have to stop here. The massive Grand Canyon was formed over millions of years. Check it out from Grand Canyon Village on the South Rim. 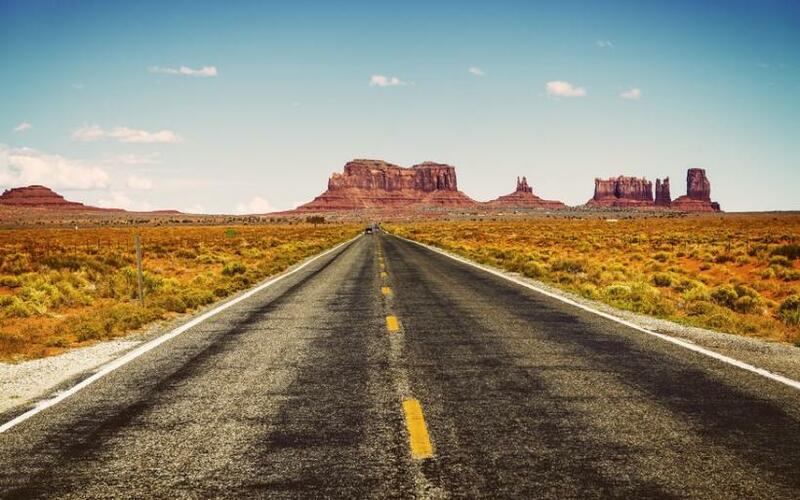 People love to drive along the iconic Route 66 and you can do just that in Arizona. Heading East from Flagstaff en route to New Mexico, you’ll find Winona, made famous from the song Route 66 “Don’t forget Winona” line. Keep going and you will come to Winslow, Arizona featured in the song “Take It Easy”, written by Jackson Browne and Glenn Frey, and made famous by “The Eagles”. Go ahead, stand on the corner in Winslow, Arizona! Santa Fe is New Mexico’s capital city and a vibrant art colony. Founded by the Spanish in 1610, the historic district features narrow, winding streets that weave past its iconic adobe buildings. Santa Fe is home to many artists of all types. There are galleries everywhere and markets featuring the artist’s wares. Enjoy a meal at one of many fine restaurants or stay overnight after exploring the historic town. The impressive Hoover Dam is located near Boulder City, which has adopted the slogan “Best City by a Dam Site”. Boulder City was originally built to house the many workers needed to build the dam. You can visit the Hoover Dam Museum and nearby Lake Mead, as well as the Nevada Southern Railroad Museum. If ever there was a city that requires no introduction, surely it is Las Vegas, Nevada. If you feel like trying your luck in the casinos, taking in a concert or show, or just enjoying some fine dining, a stop in Las Vegas is always fun. Oh, and of course, world class golf courses can be found here as well! A drive along Zion Canyon Scenic Drive is breathtaking and goes through the main section of the park along the Virgin River. You’ll come to Emerald Pools with its lovely waterfalls and hanging garden. Further along you’ll find Zion Narrows. The park is one of the most popular national parks in the U.S. Built along the Great Salt Lake, Salt Lake City is Utah’s capital, with a backdrop of the snow-covered peaks of the Wasatch Range, home to several famous ski resorts. The city hosted the 2002 Winter Olympics. In Downtown Salt Lake City you will find the expansive Temple Square, headquarters of the Mormon Church, where the Mormon Tabernacle Choir performs. Stunning Mesa Verde National Park is in southwest Colorado. The park is home to the Ancestral Pueblo people’s cliff dwellings dating back to AD 600 to 1300, including the enormous Cliff Palace. The Chapin Mesa Archeological Museum tells the story of the ancient Native American culture. Mesa Top Loop Road will take you past archaeological sites and lookout points, including Sun Point Overlook. The park has almost 5,000 archeological sites that are among the best preserved in the U.S.
Beautiful Colorado Springs sits at 6,035 feet, so you may not want to visit if you have heart problems. The city is located at the eastern side of the Rocky Mountains near Pikes Peak. Pike National Forest offers hiking trails and a railway leading to the 14,114 foot summit. And don’t miss a drive through the spectacular Garden of the Gods. Colorado Springs is also home to the U.S. Olympic Committee, the Colorado Springs Olympic Training Center and the U.S. Olympic Museum - a great place to see Olympic athletes in action. Grand Teton National Park comprises the Teton mountain range, the towering Grand Teton peak and Jackson Hole. The park is linked with Yellowstone National Park by the John D. Rockefeller, Jr. Memorial Parkway. The alpine scenery is spectacular, as are the crystal clear lakes and amazing wildlife. Yellowstone National Park is a vast wilderness area located mostly in Wyoming, although parts of it are in Montana and Idaho. Yellowstone is known for its steep canyons, wild rivers, hot springs and geysers, including the renowned Old Faithful. The park is home to a variety of wild animals including bears, wolves, bison and antelope. If you are a Buffalo Bill fan, you’ll want to stop at Cody to visit the Buffalo Bill Center of the West’s five museums. These include the Buffalo Bill Museum, tracing Cody’s life, and the Draper Natural History Museum. Old Trail Town is a re-created frontier town with log cabins and a saloon. The Black Hills are loosely divided into two areas: The Southern Hills and The Northern Hills. The Southern Hills are where you will find Mount Rushmore, Wind Cave National Park, Black Elk Peak, Custer State Park and the Crazy Horse Memorial. You also might want to visit the world’s largest mammoth research center at Mammoth Site in Hot Springs. The Northern Hills include Spearfish Canyon, Deadwood, and Devils Tower National Monument, located in the Wyoming Black Hills.